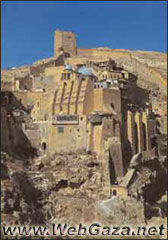 Mar Saba's Monastery - Where Is Mar Saba's Monastery? Half way between Bethlehem and Jericho, through the deep valley of Kidron, you will find an old monastery on the southern end of the deep valley, looking like a medieval fortress hugging the mountain. This monastery was built by St. Saba in 483 AD. He started his life as a hermit in the caves of that prairie, dedicating his days and nights to prayer and fasting. This Saint was born in 439 AD in Turkey. He was an orphan, and remained in his uncle's care until he came to visit the Holy Land and decided to remain there as a hermit. Many monks joined him in the caves of the prairie reaching 2000 in number. He built this monastery to house them. The magnificence of the building is astounding, and it contains many old icons, books, and manuscripts that are invaluable and unique. The gate to the monastery is very small, yet famous for a huge key. There is a guard's tower where monks used to take shifts watching the road for caravans coming from Jordan and other countries of the Fertile Crescent to Jerusalem carrying goods and supplies. The merchants always gave alms to the monastery and its hermits who in return gave assistance and services for all the passers by. At the bottom of the monastery is a cave with a water spring that has an exceptional taste. This spring is the only one in this deserted prairie. The monastery follows the Greek Orthodox Patriarchate in Jerusalem and still goes by the old system since St. Saba. Time is lunar, and fasting, eating and prayer each have traditions that have remained since the establishment of the monastery. Women are not permitted to enter the monastery, and nearby there is a small convent called "The girls' convent" where women can stay. When the crusaders left Palestine, their leaders took with them the body of St. Saba to Venice. In 1964, following a Papal visit to the Holy Land, Pope Paul the 6th promised to return the body to its monastery. The Body of St. Saba lies now in a glass coffin in the monastery, and it still retains excellent shape.